I have to admit that for a long time I was envious of knitters. Why did they get all the cool sock patterns? A search for crocheted sock patterns would find slippers or baby booties or cutesy animals. No real honest-to-pete in-your-shoes wear-them-in-public socks. Times have changed! 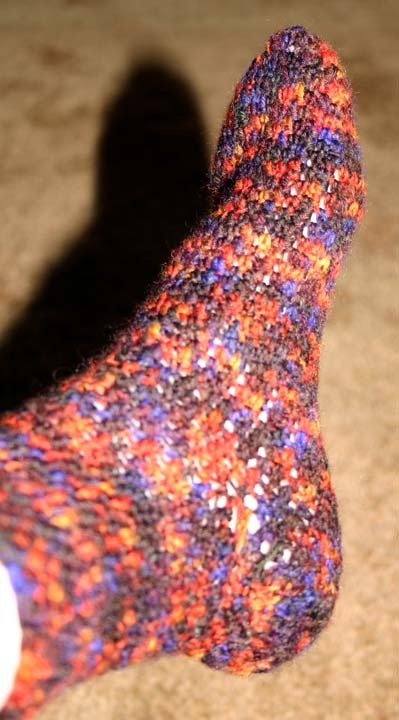 I just finished my third pair of socks and have another pair on the hook. I wore my orange socks to a spinning class in Modesto and got lots of nice comments. Reaction was more "where can I find the pattern" than "you crocheted them? Is that possible?" Sock patterns are on the web, in the magazines and on the bookshelf. A couple of good patterns are here and here. 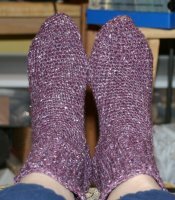 I'm still looking for a 'favorite' pattern; one I can fall back on when I find a yarn I just have to work up RIGHT NOW. Anybody have a suggestion? What's your favorite pattern? And sock yarn? It's everywhere and it's wonderful! I have red-white-blue yarn, purple yarn, self-striping yarn, wool/nylon yarn, cotton yarn - all ready for that perfect pattern. I can't walk into a fiber store without sock yarn begging to come home with me. I've bought it from major manufacturers, home dyers, and spun my own. Want wool, nylon, cotton or a mix? Easy to find. How long can this cornucopia last? Not long enough! I better go gather more stash for the coming drought.